Skills routing provides a way to identify specific skills for both visitors and agents and route chats accordingly, helping make sure your customers get the relevant and targeted support they need. For example, you might want to create a skill for Spanish-speaking visitors and agents so that chats are automatically routed appropriately. Note: To use skills-based routing, you must have assigned chat routing enabled. See Setting up chat routing for information. Agents must have all of the skills a visitor has to be routed chats for that visitor. For example, if a visitor is tagged with skills A, B, and C, but an agent is only tagged with skills A and B, that visitor's chats will not be routed to the agent. Maximum wait time, which is set when you enable the feature (see Enabling skills routing below) specifies the amount of time a chat will wait for an agent with the exact set of skills. Once the maximum wait time has elapsed, the chat can be assigned to any other agent. Agents set to Invisible, Away, or Offline are not included in the queue for routing. Before you can route chats based on skills, you need to create skills that you'll later assign to your agents and visitors. Select Settings > Routing, then select the Skills tab. Enter a name for your skill. After you've created the appropriate skills, you need to assign them to agents so they can be routed the correct chats. Agents can be assigned a maximum of five skills. There are a few different ways you can manage agent skills. 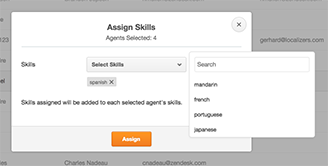 Select the check box next to the agent or agents you want to assign skills to. Click the Actions drop-down menu and select Assign Skills. In the window that appears, select skills to add from the drop-down menu. Click then name of the agent you want to assign skills to to open their profile. In the Skills field, select the drop-down menu and search for or select skills to assign. To remove a skill, click the X next to it. Select Settings > Personal > Profile. In the Profile tab under Preferences, select the drop-down menu in the Skills field and search for or select skills to assign. From the dashboard, select Settings > Triggers. Enter a name and brief description for your trigger. Click Enabled at the top to enable your trigger. In the Customize Trigger section, configure to check conditions related to your skill and assign the tag accordingly. For example, the screenshot below shows how you might set up your trigger to tag visitors from Spain with the "spanish" skill created above. For more details on setting up triggers, see Working with triggers. The final step in the process is to the enable skills-based routing feature. Note that in order to use this feature, you must already have chat routing enabled. For details about chat routing, see Setting up chat routing. Click the Settings tab, and make sure you have selected Assigned for chat routing. In the Skills Routing section, select On. Select a value in the Maximum Wait Time field. This setting determines how many seconds a visitor should wait in the queue for an agent with matching skills before being reassigned to another available agent. 1: Is it possible for agents to decline a routed chat if they're busy handling another chat? I know that it's possible to set chat limits, however it would be ideal for us to be able to decline a routed chat like you can using Zendesk Talk. 2: I would like to be able to manage which fall-back group a routed chat falls in to, when it's not being picked up by my employees. It seems to me that the system automatically chooses who to assign an unanswered chat to. It would be nice to be able to create groups like with Zendesk Talk, so if a chat isn't picked up, it would go back to a specific group and could be picked up manually like the Broadcast routing mode. 3: As we use both Zendesk Talk, and Zopim chat, it would be nice if the two systems talked together and would set agents as unavailable on chat if they're handling a call in Zendesk Voice. Currently my agents have to set themselves as unavailable when handling one or the other. (Zendesk Talk and Chat). 4: Is there a way to do both Broadcast routing mode and assigned routing mode, or is does it only work one way or the other? As described above, it would be perfect if routed unanswered chats could end up as "incoming" chats for the whole team to see and manually pick them up afterwards.